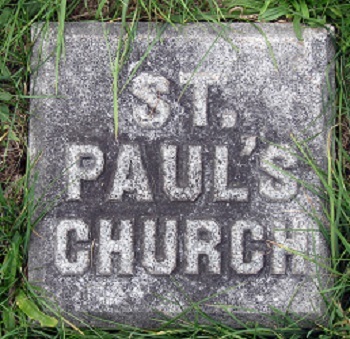 In its almost 190 years, St. Paul’s has had a number of distinguished members, men and women who have played important roles on a local, statewide or national stage. But we can claim only one member whose image appears on United State currency. As owner and editor of the Albany Argus, as president of Albany’s National Commercial Bank, as chairman of the New York State Democrat Committee, and as Secretary of the Treasury, Daniel Manning is among the most prominent who have sat in our pews. Daniel Manning was born in Albany in 1831. He began work at age 11 as a “chore boy” at the Albany Atlas. The Atlas merged with the Albany Argus in 1856, and Manning rose through its ranks, first as a reporter, then editor, and finally owner in 1873. Through this period, he also made political contacts, and was a member of the New York delegation at the Democratic conventions of 1876 and 1880. By the 1884 Democratic convention, Manning had become chairman of the New York delegation. He championed Grover Cleveland as a presidential candidate, and successfully fought for his nomination in the Democratic convention. During the election, as chairman of the New York State Democratic Committee, Manning made certain that ballots were properly counted, ensuring Cleveland’s victory in the State. His appointment as Secretary of the Treasury was not purely a political gift. As a board member of Albany’s National Commercial Bank beginning in 1873, and its president since 1882, Manning had become knowledgeable about fiscal policy, and had presented Cleveland with a plan for improving the Treasury Department. Contemporary reports suggest that he was among the most competent and intelligent of cabinet members during Cleveland’s first term. By 1886, there was even talk within the party of proposing Manning for nomination as president in 1888. Manning’s health had been poor for some time, and in early 1887 he resigned his position and returned to Albany. He died on Christmas Eve 1887 at the family home on Lancaster Street, just one block from the church. Daniel Manning had attended St. Paul’s for about thirty years, but had only been confirmed and become a communicant at Easter 1882. His son, James Hilton Manning was a St. Paul’s vestryman for twenty years, from 1883 until 1903. December 28, 1887 reported that “[I]t was the most distinguished gathering of men Albany has ever seen at a funeral of one of her sons. “ President Garfield and five of his cabinet arrived that morning in a special train car. A sixth cabinet member arrived separately; only one cabinet member missed the event. Among the cabinet was Manning’s successor as Secretary of the Treasury, Charles S. Fairchild, who, in another St. Paul’s connection, was a vestryman here from 1873 to 1878. To date, Manning and Fairchild are the only two members of St. Paul’s who have served in a presidential cabinet. Here is the original telegram from Daniel S. Lamont (Cleveland’s private secretary and a Daniel Manning protégé) to James H. Manning describing the plans of the presidential party. Delegations arrived from New York City, Brooklyn, Tammany Hall, the Democratic party, and the U.S. Treasury Department. Delegations from Albany included the Directors of the National Commercial Bank, the Typographical Union, the local Masonic lodge, and city and State officers. The funeral of ex-secretary Manning to-day was the most notable, with the exception of that of Grant and Lincoln, ever seen in old Albany. Not only the citizens of this city filled the streets and packed those adjacent to the church, but people flocked in from the surrounding country in large numbers and added to the density of the throng… The crowd about the church was dense, and choked the entire street for more than a block. The police with difficulty kept passageways open to admit the various bodies. The service was conducted by St. Paul’s rector, J. Livingston Reese, who also preached the sermon. the rectors of all the Albany parishes, the president of Hobart College and a group of canons and honorary canons from the Cathedral of All Saints. Music was provided by St. Paul’s choir, led by choirmaster George Edgar Oliver, who had composed new music for the event. The twelve pallbearers were men with national reputations, including a U.S. Senator, a former U.S. Senator, a Congressman (and former Speaker of the House), and a judge of the New York Court of Appeals. Six were bankers, two of whom had served at high levels in the U.S. Treasury; most held powerful positions in the Democratic Party. Here is Manning’s tombstone in the Albany Rural Cemetery. In other memorials, an engraving of Manning appeared on the U.S. silver certificate issued in 1886 and 1891. And closer to home, Daniel Manning may now be most remembered as the person for whom Manning Boulevard was named. This entry was posted in Clergy, Lancaster Street Building, Vestry on June 20, 2016 by Paul Nance. Fascinating! Do you know if any of the special music that choirmaster George Edgar Oliver composed survives?